During one of our usual long drives with mates, I really wanted to take a detour and head to Ambur for biriyani. But the guys, being the usual spoilsports, went against my idea and we were simply at the look out for a decent place to hit for lunch. 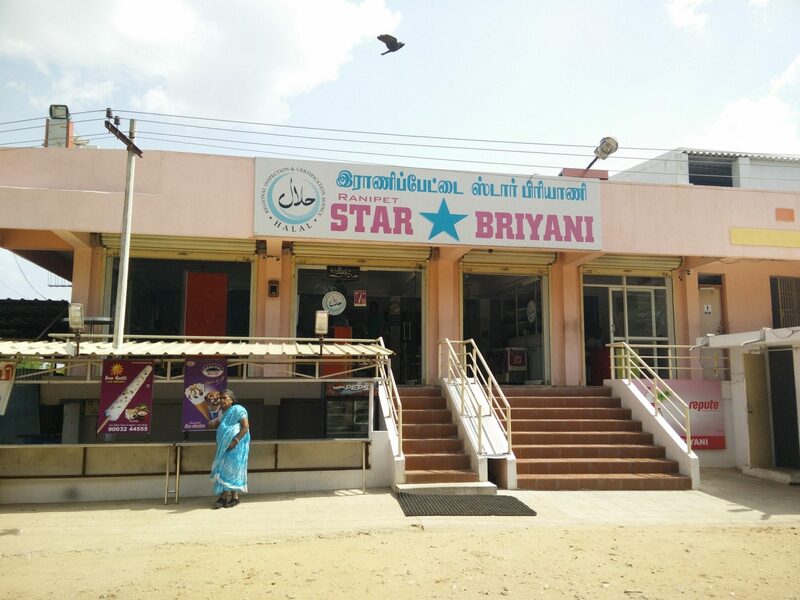 After the Ranipet toll booth, Star Biriyani is one major landmark in the otherwise empty road. Without much choices, we had to stop here for our lunch. There is an abundant amount of car parking space. Ambience doesn’t have much to write on but the place looks decent enough to dine in with family. For a late afternoon, they were doing pretty brisk business. It’s no wonder what we ordered, we got a plate of biriyani each, a chicken pepper fry and another chicken based fried dish called Chicken 555. Biriyani was very OKish. For a place who’s brand image is around a particular dish, this was quite a disappointing biriyani. Mutton pieces, on the brighter side, were succulent and super soft. Chicken pepper fry was another disappointment. Nothing about it is worth writing about. Their much acclaimed Chicken 555 was decent in taste. Ironically, onion rings, dipped and fried in the same batter, tasted amazing and even better than the chicken. For once in my life, I saw my friends fighting for the fried onion rings rather than the chicken. I do know that service isn’t something that I should even be thinking off at such a place but it was a pretty bad here. Even biriyanis, that’s obviously cooked and ready to be served, took a considerable amount of time to reach our table. At Rs. 1120, the price tag does look decent, but for what was served, I don’t think it’s worth the money. Star biriyani is a place that’s better skipped if going through this road.